On November 9th, a group of musicians will gather at Fitzgerald's to celebrate the life and music of Charles Mingus, and to benefit the Les Turner ALS Foundation. Mingus, an American genius who died of ALS, is one of the greatest figures in jazz history. His bass playing, compositions and philosophy have transcended his genre and left indelible marks on music history. ​This Mingus Awareness Project concert is presented by the Borderbend Arts Collective, in partnership with the Les Turner ALS Foundation. More than a dozen Mingus Awareness Project concerts have happened since its inception in 2007. Mingus Awareness Project concerts have happened in the Chicago area (at the Velvet Lounge, FitzGerald’s, Jazz Showcase, Hideout, HotHouse, and Martyrs’) and Richmond, Virginia (at The Camel, Rhythm Hall, and Balliceaux). Attendees will have opportunities to participate in a raffle during the event -- from Sue Graham Mingus and the Charles Mingus Jazz Institute, Reckless Records, Dusty Groove, Jazz Institute of Chicago, Old Town School of Folk Music, Brian Jones, Mitchell's Premium Ice Cream and Candies, El Meson Mexican Restaurant, and Residence Inn Chicago O'Hare. Your donations are greatly appreciated. All proceeds will go to benefit the Les Turner ALS Foundation. ​The Les Turner ALS Foundation, founded in 1977, is Chicago’s leader in research, patient care and education about ALS, serving the vast majority of people with ALS in the area, offering help and hope when it’s needed most. One of the nation’s largest, independent ALS organizations, the Foundation allocates all funds to local research, clinical care and support services for people with ALS in the Chicagoland area. The Foundation’s full spectrum patient service programs include: in-home consultations, support groups, equipment loans, grants and educational activities. The Foundation offers hope for a future without ALS by supporting the Les Turner ALS Research and Patient Center at Northwestern Medicine, bringing together three research laboratories and a multidisciplinary patient clinic under one umbrella. Amyotrophic Lateral Sclerosis (ALS), is a rapidly progressive disease that causes muscle weakness, difficulty speaking and swallowing and, generally, complete paralysis. 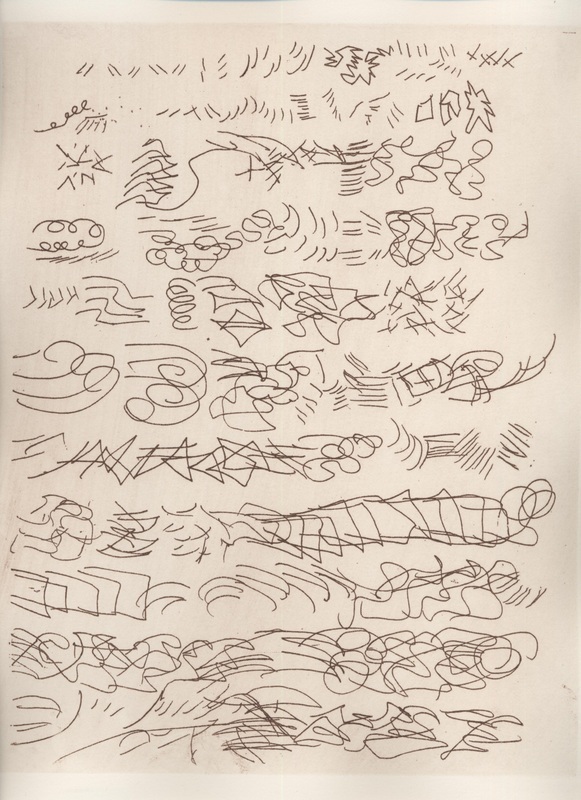 In most cases, while the body continues to deteriorate, the mind remains unaffected. The disease does not discriminate, striking any age, gender and race. Every 90 minutes, someone in the US is diagnosed with ALS and every 90 minutes, someone in the US dies of ALS. There is no known cure for ALS and, once diagnosed, patients typically live only three to five years. Thanks to everyone who came out to support the Mingus Awareness Project concerts in Chicago and Richmond last year! Click here to find out more about those concerts, and to listen to the music that was performed. After Mingus' "Better Get Hit in Your Soul" by Deborah Meadows. This lithograph is part of Charles Mingus at 90. Congratulations to the NO BS! Brass Band, which released two excellent albums in 2013. One of those was RVA All Day, and the other was Fight Song: A Charles Mingus Tribute, which was featured in PASTE Magazine, The Wall Street Journal blog, and other publications. Check out NPR's Tiny Desk Concert with NO BS! Brass. Click here to check out the Charles Mingus at 90 media gallery -- in celebration of Mingus' 90th birthday. 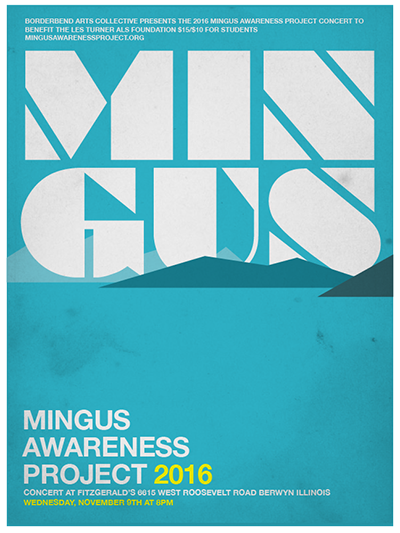 Mingus Awareness Project painting by Alpha Bruton. 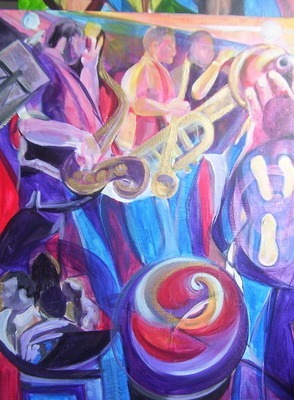 This acrylic painting is part of Charles Mingus at 90.